Facebook: Scandal-scarred, but does anyone care? General Electric: Down and out, but is it rebound time? Shutdown this week, downgrade of U.S. Treasury debt to follow? 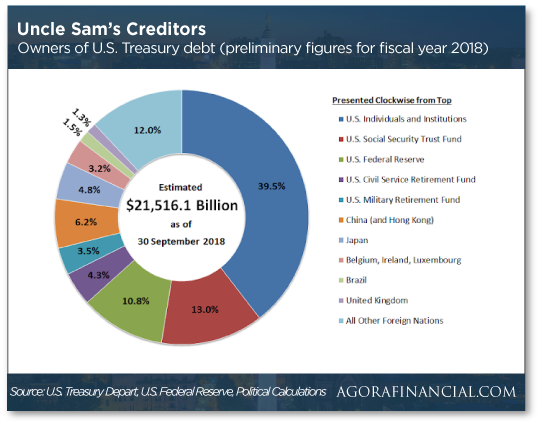 Who owns U.S. Treasury debt anyway? Yeah, so the whole “Delete Facebook” campaign was a nothingburger. Nearly a year ago, Facebook’s reputation started taking a series of hits with news that the data of as many as 87 million Facebook users fell into the hands of a political campaign consultant without those users’ knowledge or consent. As the scandals snowballed, “Delete Facebook” became a thing. It seemed as if FB had become one of the most loathed companies on the planet. FB shares swooned from a peak of $218 in late July to $124 by Christmas Eve. Then a few days ago, Facebook delivered its quarterly numbers — the first meaningful snapshot of how much damage the many scandals had done over the previous nine months. “I love hated stocks,” says Alan Knuckman — our eyes and ears in the Chicago options trading pits. “I’m talking about the ugly stocks that get bashed on TV every day by slick Wall Street analysts. These names are deeply unloved by the markets, and as a result… they’re dirt-cheap. “As bad news comes out about a company, stocks fall as ‘long’ investors sell their shares and short sellers (investors betting on a stock to drop) pile on,” Alan explains. “In general, stocks often fall as short interest — the number of short sellers versus a company’s available shares — rises. “But once all the bad news has been priced into a stock and there are no more sellers… these stocks can rally sharply higher on the slightest hint of good news. Especially when the broad market is recovering from a bout of volatility. “Right now, hated stocks are soaring,” Alan goes on. “When stocks rally like they’re doing right now… the short sellers get squeezed and buy back shares in droves to cover their losing bets. These ‘short squeezes’ send shares soaring like a rocket, making traders rich quick. So about Facebook’s latest numbers: How much damage did the scandals do? Not much, it turns out. Sales and profit figures came in ahead of expectations. Heck, sales rose 30% year over year. Monthly active users rose to 2.32 billion — including 1 million new users in the supposedly “mature” North American market. To be sure, there’ve been questions about FB gaming its user numbers since — well, for as long as FB has been a publicly traded company. We’ve raised those questions ourselves. “There’s a lot more upside where that came from, too,” Alan says. “The stock has traded in a tight range between $125 and $150. And the breakout targets $175. From there, the stock could easily make a run at its previous all-time high just below $220. Want another? Try General Electric. GE also reported its numbers a few days ago. “And although it missed analyst earnings estimates,” says Alan, “the company beat on top-line sales.” Another one-day pop of 10% in the share price. [Ed. note: Alan’s research into “hated stocks” is turning up a host of even more lucrative opportunities right now. We’re talking a quick five-figure payout — $11,114, to be precise. And that’s a conservative estimate. Stocks are off to a sleepy start this week — the Dow down slightly, the S&P flat and the Nasdaq up slightly. 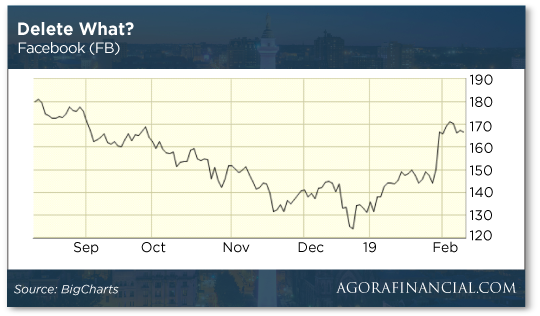 But zooming out beyond one day’s action, “There has been a noticeable momentum shift from bearish to bullish in the last few weeks,” says the aforementioned Alan Knuckman. “The S&P is currently at the halfway point between the December drop and the September all-time high. Gold is down a tad at $1,309. Crude is down more substantially at $51.71. Another “partial government shutdown” looms at the end of this week — and this time perhaps a downgrade of U.S. government debt. “On Jan. 9, Fitch — one of the three largest ratings agencies — warned America’s AAA credit rating was in danger of getting cut if Congress fails to come up with a long-term solution to the debt ceiling,” says our Mike Burnick. “The consequences of a credit downgrade would be painful. “First of all, a credit downgrade would result in higher borrowing costs for the Treasury Department. Even a small bump in interest rates is a big deal when the national debt is sitting at $22 trillion. And Washington is adding to our nation’s debt burden at a breakneck pace, with the last trillion dollars’ worth taking only six months to pile up! Not to mention the short-term stock market consequences: When Standard & Poor’s downgraded U.S. debt in 2011, the stock market tumbled more than 18%. Mike says to prepare for that eventuality, you’ll want to “concentrate on adding as many low-volatility, high-dividend-yielding stocks as you can to your portfolio.” Like these. Here we go with a new wave of catalytic converter thefts. It happens every few years: A cursory search of The 5’s voluminous archives finds a wave in 2011 — when precious metals prices were at record highs — and again in 2014. The pollution-reducing catalytic converters in your car are made with some of the lesser-known precious metals like platinum, palladium and rhodium. As it happens, palladium prices are now higher than gold — after a 50% climb the last six months. “What tends to happen is that in the middle of the night, a group of guys come by with a truck and a reciprocating saw,” Chicago Police spokesman Howard Ludwig tells The Wall Street Journal. “They cut out the converter, throw it in the truck and drive away,” The converters can sell for $150–200 a pop. Supply-and-demand dynamics won’t necessarily bring down palladium prices and make theft less attractive, either. Palladium is usually mined as a byproduct of other metals — platinum in South Africa, nickel in Russia. Not mentioned in the Journal story is the fact that the surge in SUV sales relative to sedans in recent years only makes theft more attractive. 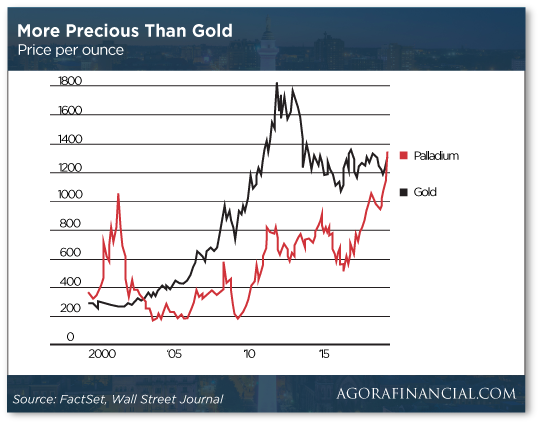 As we pointed out during the last wave a few years ago, bigger vehicles require bigger catalytic converters… and more palladium. So we went back to Friday’s episode of The 5 to examine what we might have said to bring on this assessment. All we did was mention that by and large, companies slammed by the president on Twitter tended to have better share price performance than companies he praised. We attached no conclusions or value judgments. It was just a curiosity, in keeping with our effort to make the tone a little lighter on Fridays going into the weekend. But in this hyperpoliticized and tribal environment, apparently some people are keen to take offense at the slightest perceived provocation. “We lived in England in a small community so we learned a lot about the British systems,” says one. “Our middle-aged neighbor was on the national health care and had to wait in great pain over a year for much needed knee surgery. “When a worthless 20-minute colonoscopy costs $5,000,” says another, “and one out of two men and one out of three women are expected to get cancer sometime in their lifetimes I will argue the system has already collapsed. It is 110% corrupt NOW! “The U.S. surgeon general is still NOT promoting a healthy diet. Is he really that uneducated or just corrupt? Who is more profitable… a sick citizen or a healthy one? Why don’t our schools teach kids good health habits? Someone like me that has spent decades studying nutrition and what the human was meant to eat is disgusted by our sick care industry as a whole. “If you believe right-wing radio pundits, Medicare for All equates to Medicare for nobody,” says our final correspondent. “That talking point (which admittedly does resonate) is supposed to be an argument against, as if Medicare is some ‘third rail’ for our growing aging population, but since I am not looking forward to being on Medicare, I suggest a stronger rebuke of single payer (another euphemism). Medicare used to have an OK reputation among many senior citizens. But with ever-rising costs… ever-rising premiums for “high income” seniors… and fewer doctors taking Medicare patients, is that still the case? P.S. Did you get the notice from our customer care director? It’s about an important change his team could make to your account, with your permission. Today is your last chance to take them up on their offer. Details here.